The lunar theories of Claudius Ptolemy in stunning old color. 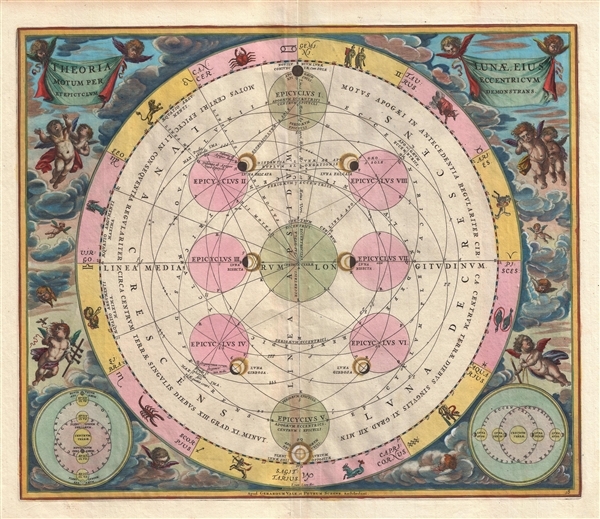 A fine 1708 Andreas Cellarius celestial chart illustrating the Claudius Ptolemy model of lunar motion. The chart illustrates the lunar epicycles as the moon revolves along various orbits. The central chart is bordered zodiacal iconography. The surround is lavishly decorated with finely engraved and colored images of clouds, putti, and two sub-diagrams. It is of note that this is beautiful colored example with giltwork incorporated into the color. Cellarius first issued this chart in 1660 in conjunction with map and atlas publisher Johannes Janssonius. The present example is from the 1708 Valk and Schenk edition of the Atlas Coelestis. It was engraved by Joannes van Loon. OCLC 165888421. Van der Krogt, P. C. J., Koeman's Atlantes Neerlandici, vol 1, HM16:1 State 2. Kanas, N., Star Maps: History, Artistry, And Cartography, Fig 7.1.